Once Salem’s WCH-TV’s late-night show call-in psychic, Lee Barrett has a lot to prove as their new and youngest field news reporter. It’s why she and her camerawoman Francine Hunter are following a tip that that police divers are searching for something dumped in the water-filled old North Shore Granite Works quarry, and why they are the first news crew to report that a body may have been left in a vintage red Mustang. The real breaking news though is the reaction by Lee’s beloved Aunt Ibby, who upon seeing the TV bulletin, drops a Spode porcelain platter of cookies while refusing to explain why. As it is, their immediate attention is required by the planning of Aunt Ibby’s Salem High School class of 1974 reunion, which is bringing together a prestigious group of graduates. The kids who once sat at the “popular table” will be missing one of their members, as an alarming discovery is made that will tie together Lee’s story with a cold case led by her boyfriend Detective Pete Mondello. For once, Pete doesn’t mind that his own “Nancy Drew” is getting involved in his investigation, as she brings her own unique talents that he has come to accept. A scryer who sees visions in reflective surfaces, Lee has learned that the sights are open to interpretation, and the real challenge is in deciphering them. When not acting like a normal cat prone to napping most of the day, her familiar O’Ryan lends a paw by rather forcefully providing his own clues that are often even more confusing than her visions. 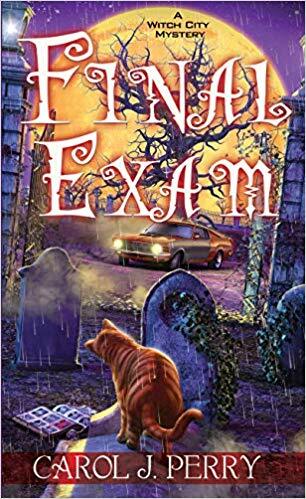 By combining a witchy investigation with her budding reporter skills, Lee will be tracing the path of a killer who has cruelly deceived a town for forty-five years. This eighth in the series continues to masterfully blend practical investigations with witchcraft elements that feel grounded in reality. Tarot card clues and readings by her friend River North are effective as they force Lee to examine her life, and while possibly predictive, they also reflect the worries she has on her mind. Well-balanced plotting and writing make spending time with these characters a delight even when they aren’t investigating, especially now as she is integrating her professional life with her witchy one. Clues sprinkled throughout lead to a logical solution, yet few will predict the motivation of the murder. Recipes included highlight the downtime Lee has with Aunt Ibby and Pete, moments filled with emotional support, comfort eating, and teasing banter: Aunt Ibby’s Ginger Pancakes with Lemon Sauce, Tabitha Trumbull’s Grapenuts Pudding, and Lee’s Bread Dipping Sauce. A heart-warming moment Lee has with one of her visions and a bench that brings back memories she didn’t know she had, deliver the perfect moments of sentimentality and genuine emotion. An edge-of-the-seat confrontation will satisfy those looking for a little more edge in their mysteries, with a resolution that cleverly reveals the twists and unravels the truth behind the clues left behind for Lee and her friends. Now that Lee is more accepting of her occasionally shocking visions, it will be intriguing to see how she continues to progress as both a talented scryer and a budding investigative reporter. The road to hell may be paved with good intentions, but it’s a simple favor that lands attorney Keli Milanni in the midst of a murder investigation and the primary suspect. When Moonstone Treasures owner Mila Douglas asks Keli if she wouldn’t mind giving customer Erik Grayson a lift, Keli is happy to help out a friend of a friend. So it’s alarming when Keli learns that Erik the Druid, in town for the upcoming Beltane Fire Festival, barely knows Mila and asks for yet another favor as he confronts an ex-girlfriend. Erik believes that Denise Crowley hexed him until he repays her for money he borrowed, but before he can sever the curse they find Denise dead in her home. Keli no longer hides her Wiccan practices since leaving her old law firm to open her own office, but that doesn’t mean that she’s ready to be outed as a witch and publicly tied to a witch’s murder. Unfortunately, a newspaper article does a lot to shove her out of the witch closet, with the result being that she loses some of the few clients who followed her from the law firm of Olsen, Sykes, and Rafferty. Worried that her implication in the death of a witch will cost Keli her new law practice, she decides to do what she can to find answers and prove her innocence. A suspicious detective isn’t subtle with his belief that Keli and Erik probably conspired in the murder, and it’s not helping that she seems to find herself more and more involved in local Edindale Wiccan activities. For as much as being the “Lawyer to the Witches” initially costs Keli her more conservative clients, it also brings a new particular set of those requiring someone with her specialty. A Wiccan fighting a custody battle and a necromancer being fined for not having a taxidermy license, these are but the start of what could be an extraordinary new branch of law. The author pulls of the trick of making Wicca and Wiccans seem so ordinary and natural, especially when faced by the irrational prejudices of certain segments of society. The exploration of Beltane as a celebration of May Day is truly fascinating, and it’s combined with clues left in Norse-themed tarot cards. A Witches’ Web social media network for Pagans brings modern-day technology to an ancient religion, and its utilization is as ironic as it is practical. The suspense is kept at high levels through ominous threats and a radio crank call-in, but what really delivers is how readers and Keli constantly waiver in their trust of Erik. Her own boyfriend certainly questions the druid’s motivations, especially as he seems to be spending a lot of time around Keli and is more than a little captivated by her. The relationship between Keli and Wes is a mature one based on trust, and it’s one that continues to evolve as she shares Wicca with the man she loves. Humor is kept at high levels with her usual BFF Farrah Anderson sidelined by a skiing injury but definitely present with her opinions, and a new mystery promises further intrigue for Keli. Readers will more than look forward to joining her as she grows as a Wicca, feels comfortable with her choices, and becomes Edindale’s Lawyer for the Witches. To enter to win a copy of both books, simply email KRL at krlcontests@gmail[dot]com by replacing the [dot] with a period, and with the subject line “magical mysteries,” or comment on this article. A winner will be chosen April 13, 2019. U.S. residents only. If entering via email please include your mailing address (so if you win we can get the book sent right out to you), and if via comment please include your email address. You can read our privacy statement here if you like. Check out other mystery articles, reviews, book giveaways & mystery short stories in our mystery section. And join our mystery Facebook group to keep up with everything mystery we post, and have a chance at some extra giveaways. Also listen to our new mystery podcast where mystery short stories and first chapters are read by actors! They are also available on iTunes and Google Play. A new episode featuring a mystery short story by Julia Buckley went up this week. Yes please, I’d love to win these books. I own the first five of the Perry books and would love to add to my collection. A recent post from Nora-Adrienne Deret: Let’s hope April Showers bring May Flowers and NOT a late season storm. Would really like to read both books. Thanks for the chance. I so want these books. I’m a practicing Witch and love a cozy mystery that has that theme. The Witch City mysteries are set in Salem, MA and that is where my boys live and where I spend lots of time. I have friends with Witch shops and I go to rituals in Salem. I have all of her previous books and I love them. 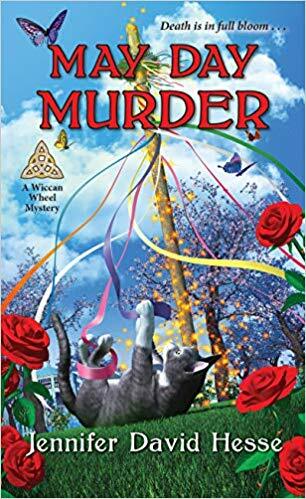 I have the first four of the Wiccan Wheel mysteries and I also love them. It’s so nice to find really good cozy mysteries that do an excellent job of understanding Wicca, Witches and who we are and that can tell a really good story.